176:2.3 In further answer to Peter’s question, Jesus said: “Why do you still look for the Son of Man to sit upon the throne of David and expect that the material dreams of the Jews will be fulfilled? Have I not told you all these years that my kingdom is not of this world? The things which you now look down upon are coming to an end, but this will be a new beginning out of which the gospel of the kingdom will go to all the world and this salvation will spread to all peoples. And when the kingdom shall have come to its full fruition, be assured that the Father in heaven will not fail to visit you with an enlarged revelation of truth and an enhanced demonstration of righteousness, even as he has already bestowed upon this world him who became the prince of darkness, and then Adam, who was followed by Melchizedek, and in these days, the Son of Man. And so will my Father continue to manifest his mercy and show forth his love, even to this dark and evil world. So also will I, after my Father has invested me with all power and authority, continue to follow your fortunes and to guide in the affairs of the kingdom by the presence of my spirit, who shall shortly be poured out upon all flesh. Even though I shall thus be present with you in spirit, I also promise that I will sometime return to this world, where I have lived this life in the flesh and achieved the experience of simultaneously revealing God to man and leading man to God. Very soon must I leave you and take up the work the Father has intrusted to my hands, but be of good courage, for I will sometime return. In the meantime, my Spirit of the Truth of a universe shall comfort and guide you. 176:2.4 “You behold me now in weakness and in the flesh, but when I return, it shall be with power and in the spirit. The eye of flesh beholds the Son of Man in the flesh, but only the eye of the spirit will behold the Son of Man glorified by the Father and appearing on earth in his own name. 176:2.5 “But the times of the reappearing of the Son of Man are known only in the councils of Paradise; not even the angels of heaven know when this will occur. 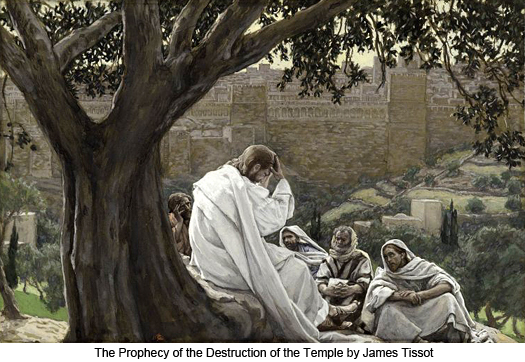 However, you should understand that, when this gospel of the kingdom shall have been proclaimed to all the world for the salvation of all peoples, and when the fullness of the age has come to pass, the Father will send you another dispensational bestowal, or else the Son of Man will return to adjudge the age. 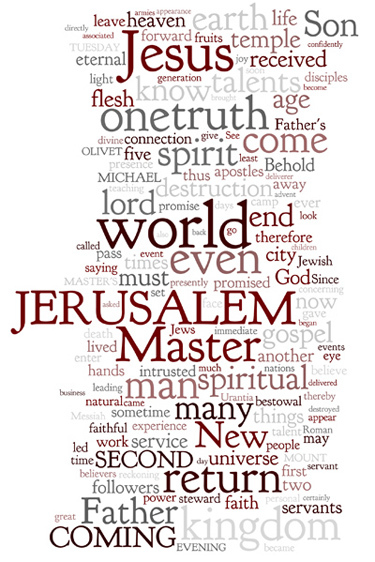 176:2.8 Of all the discourses which the Master gave his apostles, none ever became so confused in their minds as this one, given this Tuesday evening on the Mount of Olives, regarding the twofold subject of the destruction of Jerusalem and his own second coming. There was, therefore, little agreement between the subsequent written accounts based on the memories of what the Master said on this extraordinary occasion. Consequently, when the records were left blank concerning much that was said that Tuesday evening, there grew up many traditions; and very early in the second century a Jewish apocalyptic about the Messiah written by one Selta, who was attached to the court of the Emperor Caligula, was bodily copied into the Matthew Gospel and subsequently added (in part) to the Mark and Luke records. It was in these writings of Selta that the parable of the ten virgins appeared. No part of the gospel record ever suffered such confusing misconstruction as this evening’s teaching. But the Apostle John never became thus confused. 176:2.9 As these thirteen men resumed their journey toward the camp, they were speechless and under great emotional tension. 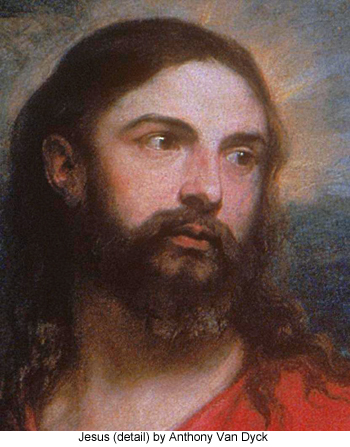 Judas had finally confirmed his decision to abandon his associates. 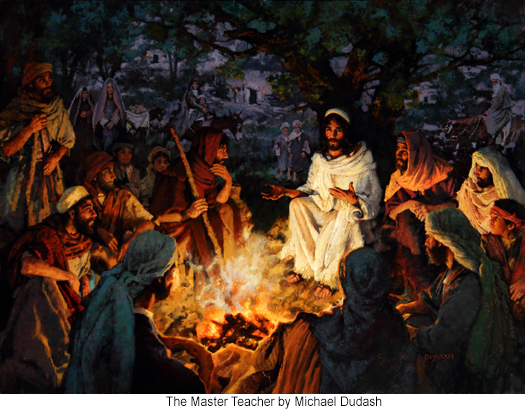 It was a late hour when David Zebedee, John Mark, and a number of the leading disciples welcomed Jesus and the twelve to the new camp, but the apostles did not want to sleep; they wanted to know more about the destruction of Jerusalem, the Master’s departure, and the end of the world. 176:3.2 “And even you, Thomas, fail to comprehend what I have been saying. Have I not all this time taught you that your connection with the kingdom is spiritual and individual, wholly a matter of personal experience in the spirit by the faith-realization that you are a son of God. What more shall I say? The downfall of nations, the crash of empires, the destruction of the unbelieving Jews, the end of an age, even the end of the world, what have these things to do with one who believes this gospel, and who has hid his life in the surety of the eternal kingdom? You who are God-knowing and gospel-believing have already received the assurances of eternal life. Since your lives have been lived in the spirit and for the Father, nothing can be of serious concern to you. Kingdom builders, the accredited citizens of the heavenly worlds, are not to be disturbed by temporal upheavals or perturbed by terrestrial cataclysms. What does it matter to you who believe this gospel of the kingdom if nations overturn, the age ends, or all things visible crash, since you know that your life is the gift of the Son, and that it is eternally secure in the Father? Having lived the temporal life by faith and having yielded the fruits of the spirit as the righteousness of loving service for your fellows, you can confidently look forward to the next step in the eternal career with the same survival faith that has carried you through your first and earthly adventure in sonship with God. 176:4.6 You would do well, therefore, to disassociate the Master’s personal return to earth from any and all set events or settled epochs. We are sure of only one thing: He has promised to come back. We have no idea as to when he will fulfill this promise or in what connection. As far as we know, he may appear on earth any day, and he may not come until age after age has passed and been duly adjudicated by his associated Sons of the Paradise corps.